The first things you notice when you go to our pond are the geese and ducks that are floating on the water or resting or feeding along the banks. There are Mallards that are easily recognized by the lustrous green head of the male and the grey or brown plumage of the female. The Mallard on the left in the following picture is a male, the center is a photo of a female, and the picture on the right shows a male Mallard in flight. 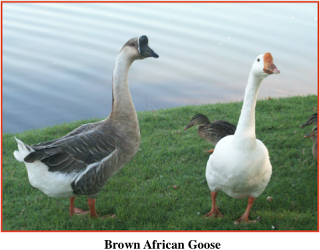 There are two Brown African geese. The male is brown and the female is pure white. They are larger than the ducks and about the same size as the Canadian geese. There are sometimes as many as 100 Canadian geese on the pond or feeding on the banks. These are the largest geese on the pond. They all have the same black neck with a white chin so I don’t know how to tell the males from the females. The Canadian geese flock together and don’t mix with the other ducks or the African Brown goose and its mate. 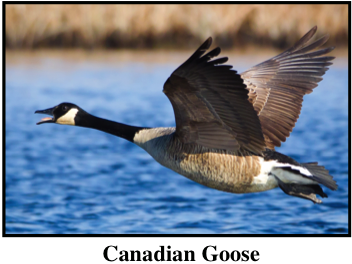 Canadian geese can be aggressive towards other Canadian geese. 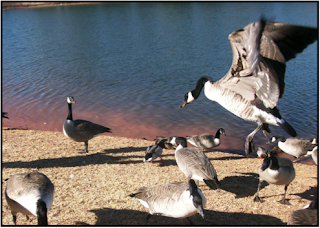 While feeding the ducks and geese, one of the Canadian geese will lower its head, elongate its neck, and lunge towards another goose. This action appears to be one of protecting its feeding area. The Canadian geese do not bully the other ducks and geese. There are six ducks that are what I call ‘barnyard ducks’. Three are pure white and there are three dark purple ducks. A brown female Mallard is part of this group too. It must have been imprinted by one of the barnyard ducks when it hatched. This group of barnyard ducks is featured in the following picture as they eat the seeds scattered by my grand son. Note that the temperature is cold enough to require a warm coat. The temperature can (and often does) vary 30º from one day to the next. 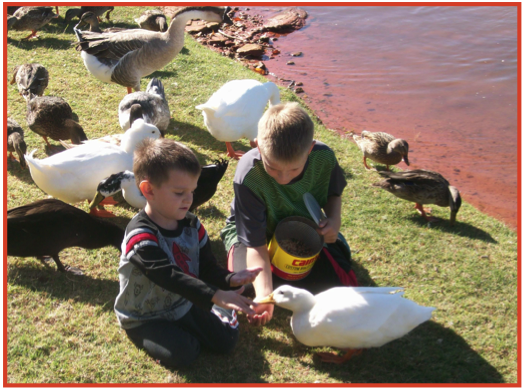 For example, a few days after the preceding picture was taken, it was a warm, sunny afternoon at the pond so Andrew, the middle grandson, and Trent are shown letting the ducks feed out of their hands. The white duck has a lame leg so the boys always make sure it gets it fair share of the seeds. When feeding, the barnyard ducks can be petted but no one has been able to even hand feed the Canadian geese. Mallards will sometimes eat from you hand but will not let you touch them. 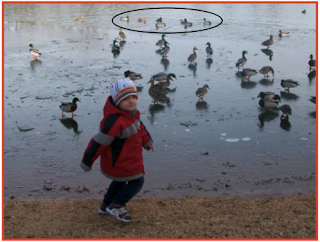 Just after Christmas, 2016, the pond froze over except for a section of clear water near the center of the pond. 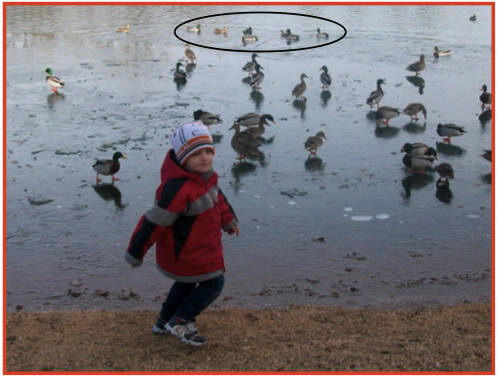 In this picture, the ducks and geese near the bank are walking (sliding) on ice as other ducks and geese float in the water at the top of the picture. 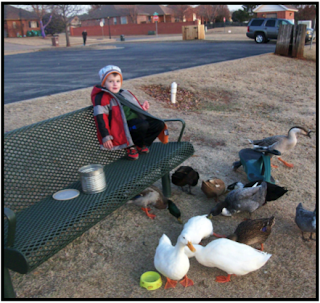 On very cold days, we feed the ducks and geese kernels of corn. There are two species of ducks that I can’t identify. One pair (in the foreground of the following picture) are black with no other color markings. This pair, probably a mated pair, normally stay away from the pond’s bank but they will swim closer when we feed the ducks and geese. They will eat the seeds we throw out into the water but we have never seen them leave the pond to feed on the bank like the other ducks and geese. These two ducks will dive completely under water and remain underwater for several seconds. I assume they are feeding but I don’t know what they are feeding on. The other ducks and geese will dip their heads under water with their bodies tilted at a 90º angle but they do not dive under the pond’s surface. 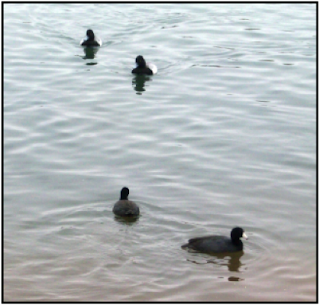 There’s another pair of ducks (upper right in the following photo) that have black heads and white and gray body markings. This pair is also probably a mated pair. 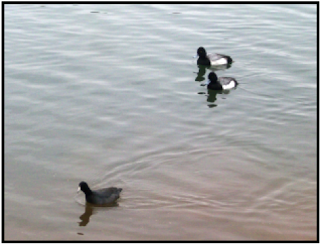 There is a bluish tint to the bills of these ducks that should help in identification. For a short time, a pair of beavers lived in the two ponds. I noticed several trees gnawed in half. The homeowners association hired a professional trapper to place traps in both ponds. Two beavers were caught and relocated by the game and fish department. 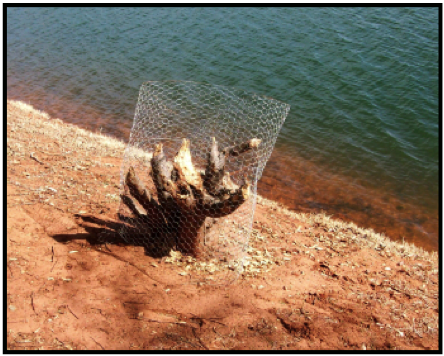 The association also hired someone to wrap the lower portions of each tree near the ponds with wire netting. Unfortunately, the wire wrap was too late for this tree. We know that there are fish, turtles, and snails living in the pond but I will report on these when the weather warms with the coming of Spring. In a future post, I will report on the single-celled and larger organisms living in the pond.